The National Solo is a classic, one-design, single-handed dinghy designed by Jack Holt in 1956 to be built in wood so that private builders could compete on a national basis with a recognised design and handicap rating. The Class Association now permits both individual constructors and commercial builders to produce the dinghy in a wide range of materials and construction methods, including the latest sandwich composites, while still complying with the class rules. The fully battened sail gives good performance in all weathers; the wide choice of rigs, foils and controls allows individuals to select the combination that best suits their sailing style and can be sailed competitively by a wide range of ages and weights. There are now over 100 fleets in the UK with approximately 1000 members of the National Solo Class Association, see site above for details. There are many more owners who simply enjoy the boat as a relatively uncomplicated and comfortable single handed craft that is nevertheless capable of providing some very rewarding sailing. 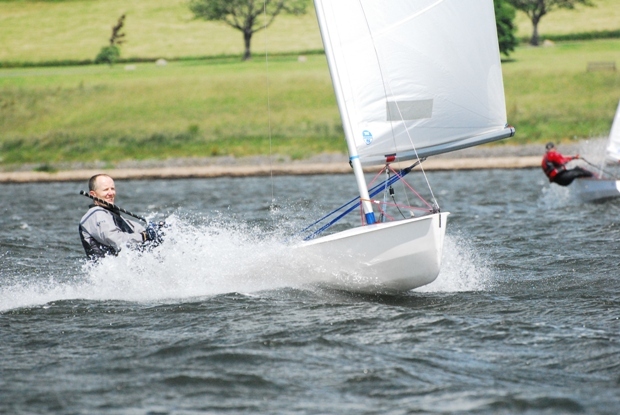 The Chew Valley Lake Sailing Club has a well established Solo fleet with about 30 members and a small racing fleet that competes throughout the year. It is a dinghy that provides close racing and Chew Valley has consistently produced a number of successful helms in both local and national events. Along with the rest of the CVLSC fleets, there is racing every Sunday throughout the year, every Wednesday during the spring and summer and many special events during the year, including Trophy races on boxing day and new years day for the fanatics!